Springtime is here, but it is also a time for unpredictable weather— meaning you should always be prepared for the chance of severe thunderstorms that lead to the perfect conditions for a tornado touchdown. The highest occurrences of tornadoes, traditionally, occur in April and May, which means we are currently in the height of tornado season throughout the United States. Included in this blog are some tips and information on tornadoes that can help keep your family prepared for the worst possible scenario. When a tornado forms there is an event where the wind speed has changed, creating a horizontal spinning effect within a storm cell. This is then tipped vertical by rising air moving up through the thunderclouds. 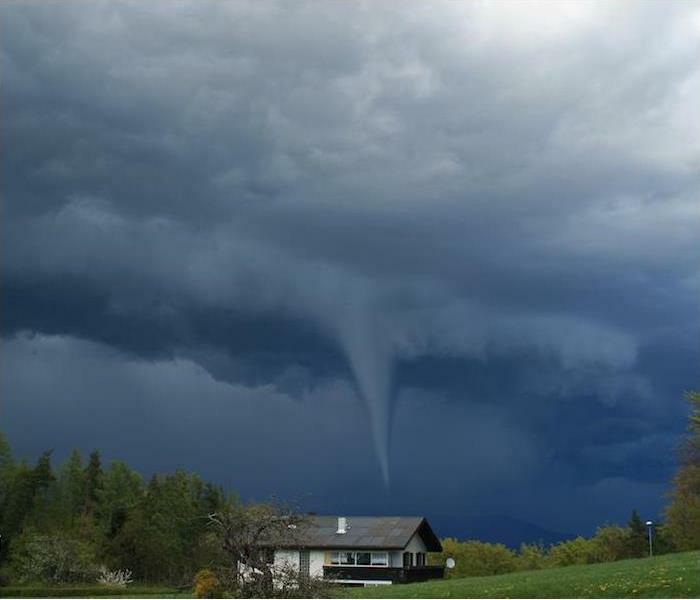 The tornado’s signature funnel cloud is transparent and not visible at first, but it becomes more visible when water droplets from the storm’s moist air condense or when dust and debris are picked up. Typically, a tornado can grow to be 660 feet wide and will move at 10 to 20 miles per hour, although larger and faster have been observed. Hail and intense winds of over 200 mph can accompany tornadoes. Tornadoes generally occur during the spring and summertime, during the late afternoon, but remember that they can occur anytime and anywhere. Understanding the difference between a tornado watch and tornado warning is your first step of defense. A watch will be issued when the conditions are favorable for tornadoes, while a warning is issued when a tornado has been reported by spotters or indicated by radar. Take action in finding a shelter immediately if a warning has been issued for your area, especially if you are in the tornado’s path. You should make sure your home shelter is equipped with flashlights, a battery-powered weather radio and extra batteries. If you are out on the road during a tornado, NEVER try to outrun a tornado. Also, when you are taking shelter in your home, you can provide additional cover by using furniture items like couch cushions, mattresses or blankets to help keep your head and neck covered. Tornadoes can be devastating for the areas where they touch down. While meteorologists and weather services can provide some advanced warning about potential threats, tornadoes can still occur with little to no warning at all. If your home or business has been damaged by a tornado, know that SERVPRO® of Amherst-Clarence is ready and waiting to jump into action and get cleanup and restoration of your property underway. Don't let your Williamsville home become infested with mold, act now! A home in Williamsville, NY that had a dishwasher leak. Don't let your home become infested with mold, act now!How often do you move your dishwasher out to inspect behind it for possible water damage? Not to often, right. This photo illustrates what could be larking behind your appliances that had a small leak for a period of time. For most cases when a dishwasher begins to have a leak it will be a slow drip beneath or behind the unit causing the floor to become saturate, rotting or mold to develop. What to do when you discover a leak in your dishwasher that caused possible water damage? 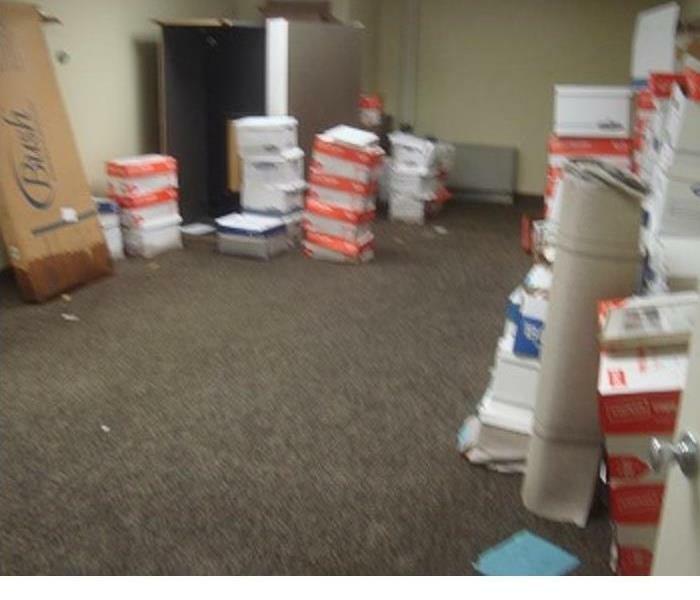 Commercial water damage surprises business owners every time it happens. Everyone knows that the sprinkler system is there to stop fire damage, but no one understands the damage that happens when it engages. 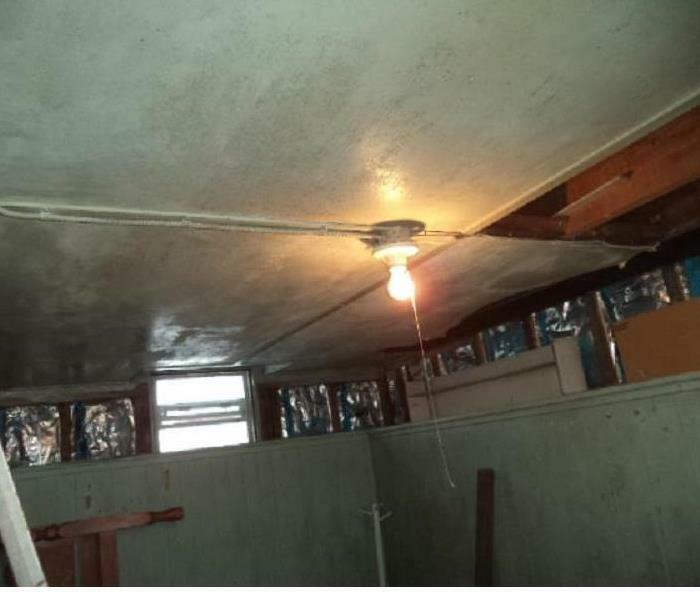 Fortunately, SERVPRO has the experience, training, and equipment to restore an office or a kitchen back to their original state. Every home should have a fire escape plan. According to the American Red Cross, homeowners shouldn’t just have a plan of escape for a fire but have a plan and practice it twice a year. Home fires cannot be predicted and can happen to anyone. If you’re making preparations to prevent home fire, you should also prepare for what you and your family would do if you have one. Here are some tips from the American Red Cross in making a plan for your home. All members of the household should know two ways to get out of every room. Consider escape ladders for sleeping areas or homes on the second floor or above. Learn how to use them and store them near the window. Practice your home fire drill until everyone in the household can do it in less than two minutes. Once the safety for your family is established, the next steps to come will be home recovery. SERVPRO will work with you from window and roof board up to assisting with the final stages of move back & rebuild. Bathroom flooding can be very destructive and damaging to your home. Flooding can lead to potential health and safety risks if not handled properly. Bathroom flooding is especially problematic because it can happen at any time of the day or night. You should know several things about bathroom flooding situations. Bathroom flooding can be caused by several things. Clogs are very common. Clogs deep in your plumbing can force water back up and out of your sink, tub or toilet. Drain problems can result in flooding. This includes a jammed drain or a drain that is filled with hair or toilet paper. The drain will stop the water from reaching the pipes. A pipe connected to a fixture could actually burst because of corrosion, age or water pressure problems. A final cause could be frozen pipes that block the drains. Bathroom flooding can do a large amount of damage to your home and possibly your health. The water can start to rot away the beams that make up the structure of the floor, walls and ceiling beneath. Severe flooding can reach your basement and damage the foundation or appliances like water heaters. Flooding can actually start to corrode other pipes in the bathroom. The water can cause toxic mold to start growing. You might catch a disease or infection if you come into contact with wastewater. Even sewer gases that come up can lead to respiratory problems and eye or nose irritation. Bathroom flooding can be very destructive and damaging to your home. You need to act fast when bathroom flooding starts. Attempt to shut off the water from a safe location. Avoid touching or standing in wastewater from toilets or backed up drains. Attempt to contain the flooding if possible so that less of your home is damaged. Do not flush toilets. If you have towels and mops, then try to minimize the amount of standing water on the ground. You must also contact a professional water damage restoration company immediately to deal with the problem. You always want to contact restoration professionals when you have a bathroom flooding situation. Professionals will know how to prevent mold growth and how to remove all the water from your bathroom safely. They will attempt to salvage as much as possible. You want to rely on a restoration company to repair water-damaged areas for maximum safety. You should always call a restoration company when you encounter flooding in your bathroom. You can prevent some bathroom flooding situations by watching what goes into the drains. Do not put large amounts of toilet paper, food or other objects in toilets and sinks. Keep solid items out of drains. Have your pipes and plumbing inspected regularly to avoid corrosion and burst pipes. Have your sewer lines and drains professionally cleaned once every one to two years. Call plumbers as soon as you see slow drains or frequent clogs. Just a few simple actions can prevent many bathroom flooding situations. When home or commercial disasters occur, SERVPRO of Amherst/Clarence is here for you. 716-639-8687. Air Movers Help Dry Out Water Damage. Remember that as the water seeps into the wooden furniture and floors, it can lead to huge losses. Before you contact your insurance company, it's important to turn off the water to stop the leak. An emergency plumber can repair the leak. Once the leak has stopped it is important to remove the water as fast as possible. SERVPRO of Amherst/Clarence has the necessary extraction equipment to remove most of the excess water. We also have the drying equipment that will remove the rest of water from wet surfaces. Water damage can be extremely costly to repair, but if you tackle the problem quickly, you can prevent the loss from becoming more costly. Cold temperatures can cause pipes to freeze. Frozen pipes can result in costly repairs to you as a home or business owner. The good news is there are ways to prevent pipes from freezing. Here are some tips for this winter. If you are leaving for a period of time, make sure that the heat is kept on at your property. You should inform them that the heat can help prevent pipes from freezing, and if pipes freeze and burst, it can cause a lot of water damage to the property and to their possessions. The heat doesn’t have to be kept as high as you normally would keep it if you were home but keeping it set above 50 degrees Fahrenheit at all times is a good idea. This should provide enough heat to keep the pipes warm and to prevent any water inside from freezing. When temps hit the freezing level it is a good idea to allow faucets to drip. Allowing the faucet to be open like this will relieve pressure in the pipe. If a pipe freezes, it is actually the pressure that is created between the blockage and the faucet that will cause the pipe to burst. With the faucet open you avoid blockage in the pipes. Pipes can be fitted with foam rubber or fiberglass sleeves to help decrease the chances of freezing. This can be an easy solution for pipes that are exposed, but can get expensive if walls, floors or ceilings have to be opened in order to properly insulate the pipe. Additional insulation can also be added to walls and ceilings to keep the pipes warm. SERVPRO of Amherst/Clarence is here to help! Call us at 716-639-8687. The Differences Between Homeowners Insurance, and Flood Insurance. There basically are two insurance policies that deal with a homeowner's damage due to water -- a flood insurance policy and a homeowners insurance policy. Losses not covered by one of these policies may be covered by the other. Knowing the losses to which your home could be exposed will help you decide whether to buy one or both of these insurance coverage. Flood damage to your home can be insured only with a flood insurance policy -- no other insurance will cover flood damage. Flood insurance is available through your insurance agent, insurance company or local Federal Emergency Management Office (FEMA). To determine if your home is located in a flood plain, contact your county planning office. If you are living in a flood plain, flood insurance may be an excellent purchase. It's important to note that flood insurance and homeowners insurance do not duplicate coverage for water damage. Instead, they complement each other. It is up to you to talk to your insurance agent or insurance company about flood insurance and homeowners insurance, and then decide which insurance coverage you need to protect your home, its contents, and your family. Mold growing on a basement ceiling that could have been avoided if properly dried out. In the 90’s mold became a news headline across the country. The strain of “Black” Mold, Stachybotrys, struck fear in the hearts of thousands of Americans. Even though that hysteria has passed, it is no joking matter to have mold growing in your home. It is true that mold spores are everywhere, but for mold to grow you have to have two things: 1) food; 2) dark moist conditions. There is very little you can do to remove all “food” sources in a house, but you can eliminate the water factor. When you have a water loss, it is incredibly important to completely dry the area affected so mold will not grow. If you try to take care of it yourself, you run the risk of giving mold a chance to infiltrate your house. Why would you do that when you can call SERVPRO® of Amherst/Clarence at 716-639-8687 and make sure your house is dry. Damage caused by fire is varied. Different surfaces, textures, and materials react in different ways to the extreme temperature which makes restoration a nuanced and complex job. Using the wrong cleaning materials can at best, spread soot and smoke residues. At worst, it can cause further damage and require expensive replacement. After a blaze has been contained, there is the added risk of secondary water damage. Properties that have fallen victim to fire damage should be pre-tested before any work begins. 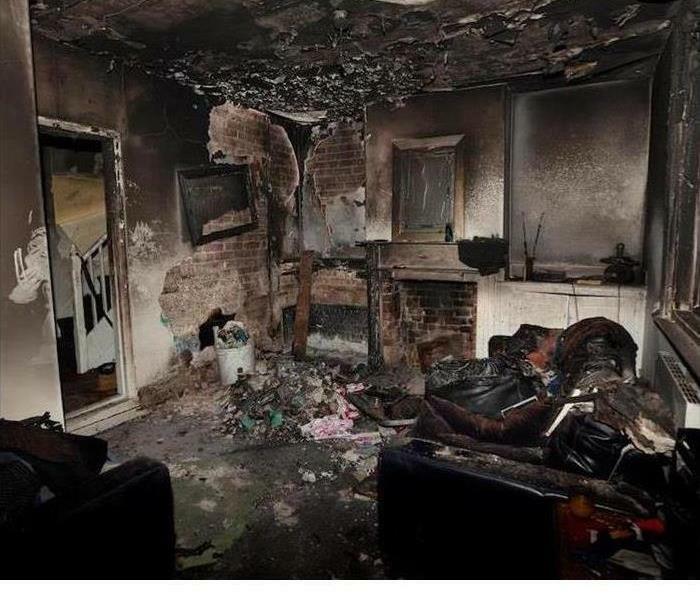 A pretest can be carried out by a qualified SERVPRO fire technician who can measure affected areas for smoke damage. Although, smoke damage is visible, there are many different types which depend on the materials that burned. Wet smoke, for example, burns at a low temperature and comes from synthetic materials that could be in appliances, lampshades or fabrics. This smoke, produced from melting plastics, has a pungent smell leaving behind thick, oily markings on walls and ceilings. Dry smoke, on the other hand, comes from natural materials like wood and paper leaving behind a powdery soot like texture. A SERVPRO technician can conduct a pre-test that looks for different types of smoke residue. A pretest allows us to decide on the correct method of restoration as well as products that we should use to restore your items to pre-fire standards. Using a combination of wet cleaning and dry cleaning allows us to provide a professional focus to each affected area and guarantee the best results. A fire restoration service by SERVPRO is two-fold. The first is your contents which can be removed, tested and restored. The second is the structure itself, which involves removing soot and smoke residue from your walls, ceilings, and permanent fittings. We can restore your walls, so they are ready for repainting, as well as your floors, windows and, where possible, fabrics. Get Your ERP. Download the app today! Amherst, NY has many options for consumers seeking quality products at a reasonable price. National and local chains compete, and the customer wins. The large warehouse-type stores are just as vulnerable as a smaller store boutique when suffering water damage and flooding if plumbing fails or torrential rains overwhelm a flat roof’s drainage system. We have the crews and equipment to respond to a significant water loss. 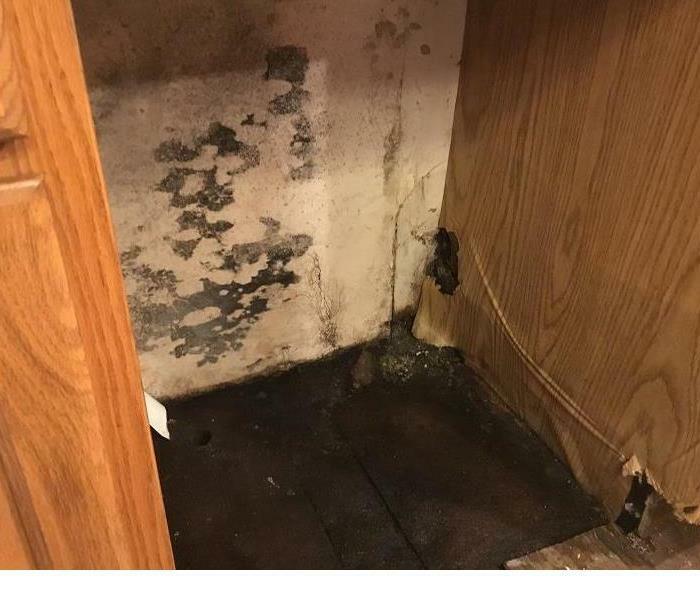 When water pours through your store, you need fast, and the water removal technicians of SERVPRO of Amherst/Clarence are the ones that can do it. Even with much of the merchandise up off the floor on steel shelving or pallets, the water must be evacuated for the safety of your staff and your customers. With floors that extend hundreds of thousands of square feet, the removal task is best left to professionals. SERVPRO is a local business with a national network to fall back upon if the scale of a job requires supplemental equipment and technicians. Sizeable commercial water losses need just as swift a resolution as those affecting a smaller shop or office. Water that lingers in the property for more than 24 or 48 hours exposes your business to the risk of microbial infestation that might even damage your inventory. Our commercial loss team works with you to devise a plan where at least a portion of your business remains open during the restoration. The water removal begins with pumps, moving vast amounts of water quickly out of all areas of your store. As the water level dips below 2 inches, technicians switch out pumps for extractors. Your flooring choice of poured concrete seems impervious to water, but it is a porous material that benefits from rapid water extraction. The floor edges get targeted attention to prevent water from wicking up the drywall or settling in the cells of cinder block construction. 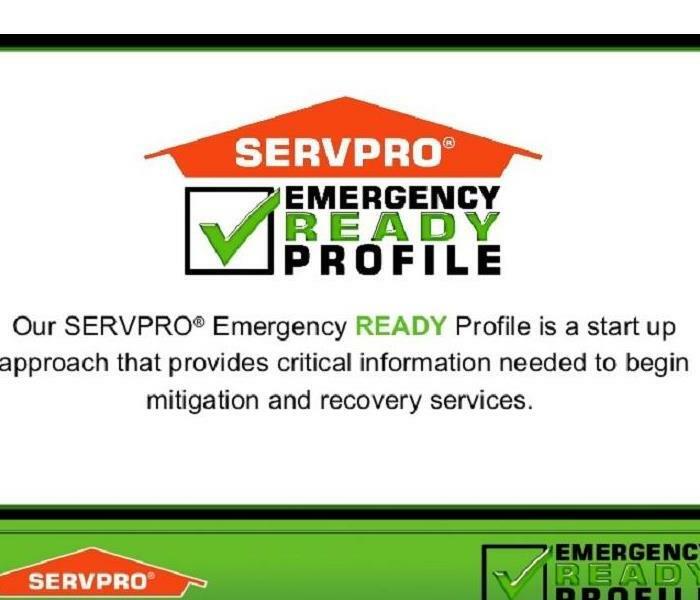 This water emergency might lead to your development of an Emergency Ready Plan and Profile (ERP) through SERVPRO in anticipation of future crises. The ERP allows us to collaborate in devising a concise plan to help both our crews and you and your staff to plan for another loss. 10/12/2018 - Don't let your Williamsville home become infested with mold, act now! 10/10/2018 - Air Movers Help Dry Out Water Damage. 10/10/2018 - The Differences Between Homeowners Insurance, and Flood Insurance. 9/27/2018 - Do You Have A Plan For Your Business?